When it became necessary to lower commuters to the trains operating between Liverpool, Lancashire and residential Cheshire, under the River Mersey, Wm Wadsworth & Sons, Ltd. installed the largest passenger elevators of the period. Completed in 1880, each of the three hydraulic elevators traveled 90 feet, and the cars were 17 feet square. The huge cabins were elaborately decorated with mirrors and seats along the side, giving vent to the term, "moving drawing rooms." The 100-passenger elevators were converted from steam to electricity in 1906. The system was damaged by enemy bombs during World War II, and in recent times, the drum machines were replaced with gearless drive units by the original manufacturer. In 1930, Otis Elevator Co. installed eight double-decker car elevators in New York City's Cities Service Building, one car serving the even-designated floors and the lower car serving the odd-numbered floors. Confusion reigned for a number of years until only one of the two cars was found to do the job! It is claimed that Athens had a law limiting the height of buildings to 10 floors and that the Emperor Constantine limited construction height to 100 feet. Similar records exist reporting of buildings 10 tiers high in Jerusalem and Tyre. 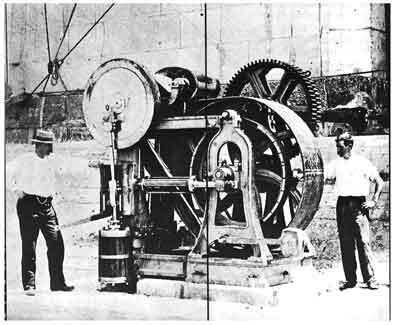 An article on the "fish elevator" on the Connecticut River, pointed out that the 9 x 7 x 4 foot "lift car" is used by the Holyoke Power Co. to hoist spawning shad over the 30-foot high dam which would otherwise be an insurmountable obstacle. In one year, 33,896 shad were lifted over the dam from mid-May to the end of June. (excerpt from Steam-hydraulic Elevator by Craig Ridgway) In most cases, the cheapest and best way to get a well for a Direct Acting Hydraulic is to dig it in the old-fashioned way. Two or three ordinary laborers will do all the work quickly, and at small cost, with a little intelligent supervision. The accompanying cut will offer some suggestions as to the manner and procedure and the simple apparatus required. To start the well, a square or rectangular hole is first dug of the size required by the platform of the elevator. In the center of this, a round hole is laid out. Four feet in diameter is found to be a good size to give a man room to work with comfort, although any size can be adopted. In case treacherous earth be met with, a curbing should be provided. This is cheaply made by sawing out segments from a one-inch-thick rough board. These segments can be from twelve to twenty inches or more, long by four inches wide, and on a circle of forty-six inches in outside diameter. These are nailed together, breaking joints to form rings forty-six inches outside diameter. One of these segments is shown on the cut. Two of these rings are taken and upon them are nailed strips three- or four-inches wide and six- to eight-feet long and one-inch thick. The lower end should be beveled off to an edge. The lower ring should be kept back about eighteen inches from the end, so as not to interfere with the digging. The number of these curbs required will depend upon the nature of the ground and the depth of the well. Weight can be given to the curb by placing bricks upon the lower ring. As there is more or less likelihood of striking water, means must be provided for removing it rapidly. The best device for this purpose is a steam ejector, which can be improvised from steam fittings, or can be purchased at a small price at any supply store. The ejector is suspended by a rope, and lowered as the digging progresses. For taking out the earth, a pulley of any sort is fastened to a support above the well, the floor above or a tripod, and a rope and a bucket attached will remove it rapidly. The old-fashioned windlass can also be used, or any other winding device. When the well has reached the proper depth, it is walled up with bricks on the inside of the curbing. These bricks are laid up dry and put in tight. The wood rings should be knocked off, as they will rot off in time and allow the brick lining to settle. Or, if desired, the whole curbing may be removed to use on other wells. If water has been struck, when the well has been walled up, it can be allowed to fill, and can be used as an additional supply. The presence of the water does not affect the elevator. Some of our customers have found the excellent supply of water discovered, in putting in the elevator, a valuable acquisition to the plant. There is no objection to having the well for one of our elevators put down in some of the other ways now followed in well-digging. But for moderate depth, the way described is likely to prove less bothersome and much cheaper. In most communities there are men who follow well-digging as a trade, who will be glad to do the work, but if such cannot be had at reasonable rates, no hesitancy need be felt in undertaking the job. The F.S. Payne Co. of Cambridge, Massachusetts, installed what was probably the world's longest elevator in 1972. The car platform 96' long by 4'4" wide, had two slings each with two-to-one sheaving and a very complex roping arrangement. The elevator with its 22:1 ratio carried a lot of barrels for the Everitt Distilling Co. We would have reproduced the blueprint, but it kept running off the page. We show instead another longster of bygone days, built by Kimball Brothers Co. of Council Bluffs, Iowa. Their automobile lifts were designed to hoist up to 40,000 pounds with four drums on a single drive shaft. 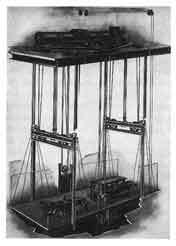 This picture is not upside down, it's just a type of hydraulic elevator promoted by Craig Ridgway & Son Company in the steam era. The piston pulled the car up and . . . well, perhaps we'd better turn the picture around after all! The first year sales of the Otis Elevator Co. were precisely US $900. The total inventory in 1853 was US $122.71 and included a second-hand lathe, two oil cans and the account book in which the figures were written. The Charter of the Paris Exposition of 1889 prohibited the use of foreign equipment in the 1,000-foot-high Eiffel Tower. The problem - no French firm would submit a bid on the inclined elevators that would take visitors on the first leg of their journey to the summit. 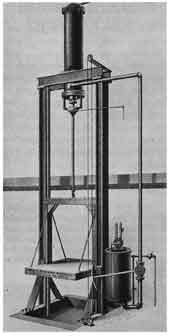 As time grew short, and no French company would step forward, a contract was signed in 1887 with the American firm, Otis Elevator Co., signaling the commencement of a project that was to contain three of the most unusual passenger systems in elevator history - one made in America and two in France. B. Trepte, the founder of Globe Wire and Iron Works in Milwaukee, wrote a dunning letter to a delinquent customer, saying in part, "We are much inconvenienced by your delay in payment and have waited longer than we think we should. The account must be settled by the 15th inst. or we will institute a lien by our lawyer. The cost of the lien by our lawyers is between US $5 and US $25 which you will have to stand. We will stay in our office all day on the 15th to await your settlement." Elevators could travel at a much faster clip, but their human cargo sets a definite limit on speed. In mines, for instance, ore lifts, which operate on the same principle as passenger elevators, zip up and down at speeds up to 50 miles an hour. Actually, it's not so much the elevator's speed as its rate of acceleration and deceleration that causes passenger discomfort. Almost every elevator rider has experienced that queasy feeling of having his stomach suddenly try to take the place of his tonsils. Medical investigators have found sound physical reasons for this uncomfortable sensation. In the course of quick acceleration and deceleration, they discovered actual displacement of human internal organs. This too-rapid change of speed is encountered mostly in old, poorly adjusted, slow-speed elevators that start with a lurch, and not in modern "high-speed" elevators with smooth and gradual acceleration and deceleration. The White House elevator installed in 1902 traveled only 75 feet a minute. Engineers who overhauled it during President Coolidge's tenure wanted to increase the speed to 250 feet a minute, but "Silent Cal" strenuously objected because he liked to be the lift's only occupant. At the increased speed, his Secret Service guardian, who had to bolt up the stairs to meet him, would never have made it. Ultimately, President Coolidge agreed to a speed of 100 feet a minute. Although he had to sprint up the stairs at a faster clip, the Secret Service man could still arrive in time to meet the President. This ancient-vintage elevator has been on view at the Smithsonian Institution since 1946. It was President Harry S. Truman that finally had it removed and replaced it with a more up-to-date model. By the time Elisha Otis died in the diphtheria epidemic of 1891, he had involved his two sons in the business - Charles R. in 1861 and Norton P. in 1890. Upon Elisha's passing, the factory was worth less than US $5,000 and employed less than a dozen men, but he had been the spark that ignited the acceptance of the elevator as a safe mode of public transportation and sired a company name of which would become synonymous with the word "elevator"! The Washington Monument is not only the tallest stone tower in the world, but one that is considered aesthetically perfect. Fulfilling the Greek ideal of strength combined with grace, engineers ascribe its perfection to a ten-to-one proportion (that of the Egyptian obelisks), its height of 555 feet being exactly ten times the base square of 55 feet. Yet, the creation of a fitting memorial to George Washington, in the city that bears his name, took a full century to come to fruition, and faced so many problems that its supporters were often on the verge of abandoning the project completely. It was not until Washington's sudden death in 1799 - only three years after leaving the presidency - that Americans realized they had failed to give thought to a monument in his memory. After decades of typical Congressional debates, resolutions and correspondence, a mausoleum was provided under the Capitol's Rotunda. As Washington's centennial birthday approached in 1832, Congress proposed that the bodies of George and Martha should rest there. However, this conflicted with the general's will which had directed his burial on his Virginia estate. Shortly thereafter, the project got underway to build the towering obelisk we see today. Ranks of Americans were asked to contribute, with the initial limit of US $1.00 per person. By 1836, some US $26,000 had been collected. This was a drop in the bucket compared with the projected US $1 million cost, but sufficient to invite American architects to submit a design. The winner was Robert Mills, a well-known architect-engineer, and in 1848, construction began. For the first few years, the Monument grew apace. To speed the process, the building society had solicited stone blocks from states, territories, friendly foreign countries and various associations. Almost 200 of these are imbedded in the wall at ten-foot intervals, and one climbing the stairway may read inscriptions ranging from donors such as the "Cherokee Nation" to "Greece - Mother of Ancient Liberty." Work proceeded smoothly until 1854 when the tower was 152 feet high. Financial problems and the Civil War interfered, and for a quarter of a century, progress almost ceased. In 1876, construction commenced once more under the supervision of the Army Engineers and about 80 feet a year were laid, culminating with the capstone being set in place on December 6, 1884. In mid-1879, the U.S. Engineer's office in Philadelphia had requested bids upon a steam-driven, drum-winding elevator that could be used in the construction phase and later be converted to passenger service. The duty was specified to be six tons at 50 feet per minute. Four companies submitted proposals and, at the end of the year, the Engineers selected Otis Brothers and Co.'s bid of US $18,350. The company commenced its work April 1, 1880, and three and a half months later their machine - operating on 80 pounds of steam pressure - had been tested on the jobsite and accepted. Thereafter, iron columns were pushed upward in each corner to a height above the outer walls which would allow the car - suspended from an overhead work's large pulleys - to bring stone to the tower's sides. A year after the capstone was placed, Otis quoted the sum of US $2,740 for converting the work elevator to passenger service. The bid included additional safety devices and the installation of a cab with cane seat settees and oil stove. An operator was hired at the annual stipend of US $900 and groups of thirty visitors began making the twelve-minute trip to the summit. During the first year, daily operation carried almost 110,000 persons except for a period of four days when the federal appropriation for fuel was exhausted. A few years later, perforated wooden seats replaced the cane, and an electric annunciator was installed in the car by which signals could be received from the engine room as well as the top and bottom landings. The alterations report of the U.S. Engineers also commented that, "A large drip pan was installed under the overhead pulleys to prevent oil dripping on the car, and the wire cables given a coating of lamp-black and boiled oil." Although Charles D. Seeberger coined the term "escalator," he initially was thwarted in his efforts to patent his early designs under that name. Instead, the patents were issued under the title "elevator." Ultimately, however, Seeberger prevailed. He registered "Escalator" as a trademark in 1900 and for half a century, "Escalator" was the proprietary name for Otis escalators. It is believed Seeberger combined the Latin word "scala" for steps with part of the word elevator (the prefix "e" with the suffix "tor") to form escalator. Other reports, however, suggest he derived his term from the French word "escalade," a "climb over a wall." No mater its origin, "Escalator" became the wold property of Otis in 1910 when the company purchased the trademark and Seeberger's patents. "Escalator" remained Otis' property until the word lost its proprietary status and capital "e" in 1950 when the U.S. Patent Office ruled that "escalator" (lower case "e") was a common descriptive term for moving stairways.